I believe it’s important to have access to a large system of accessories. I certainly wouldn’t buy a lesser known system such as Ricoh, Pentax, Olympus or Sigma. That’s because there isn’t much support for those systems in the way of aftermarket accesories. The one thing that I find most important in choosing a system is the glass—the lenses. No matter how good the resolution or size of the sensor or quality of the image processor, without good glass, your pictures will lack in quality. Some of the best glass is German, with Japanese a close second, but you won’t get that level of quality in a $200 point and shoot. For quality lenses, plan on easily spending over $600 for a single lens and well over $1,500 if you want a really good high-speed lens. Great glass comes from German makers such as, Leica, Zeiss and Schneider. You’ll find these lenses paired with cameras from Panasonic, Sony and Samsung, respectively. Good glass comes from Nikon, Canon and Fuji, which they use on their own brand of cameras. One look in my bag and you’ll immediately notice that I don’t own any off-brand lenses such as Tokina or Tamron. I wouldn’t be caught dead with a Vivitar, Quantaray or Sigma lens. The only non-Nikon lens accessory I own is a Kenko extension tube that has no glass. I shoot Nikon optics because the picture quality is easily noticeable in side-by-side comparisons. In the past, when I have owned non-Nikon lenses and upgraded to the equivalent Nikon lens, I have compared similar pictures and immediately noticed the improved sharpness, contrast and color saturation. There is also less lens flare, ghosting and chromatic aberration due to better quality glass, coatings and construction. Nowhere is this more apparent than in smaller sensor size digital photography. Even the slightest degradation in lens quality is immediately seen. Typically, the kit lens you get with your camera is just okay. It’s often worth it to upgrade to a better, faster lens. Sure, good lenses are more expensive, but if you want better photographs, the difference in picture quality is worth the extra money. Besides, your lenses, like my original Nikkor 55mm Macro, may get used for a long time, so don’t be frugal with your glass. The other important equipment you’ll notice is camera support. I have several tripods and lots invested in ball heads and camera plates. There are many people who insist that with today’s higher speed cameras and vibration reduction lenses, a tripod is no longer necessary. Not true. You don’t need a super-long telephoto lens to benefit from using a tripod. That’s because no matter how much you try, you’ll never be able to hold your camera steady enough to get a razor sharp image. Increasing shutter speed or ISO settings means you sacrifice depth-of-field control or picture quality by not using your lens’s sweet spot. A tripod guarantees that you’ll get sharper images and may also cause you to slow down and better compose your photo. 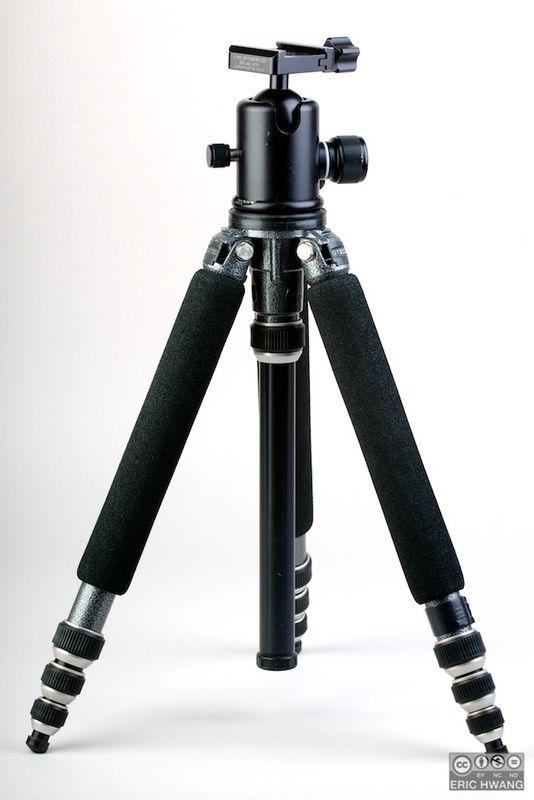 I use Gitzo tripod legs because they are rock solid and durable. I’ve had my Gitzo legs for nearly 12 years and they have been all over the world without any problems. There are few things that I know of that I can say that about. I use ball heads because of the speed of adjustment and the strength of its hold. In my book, Arca-Swiss is the best. Their ball is slightly elliptical and increases in friction as the camera tilts so it’s less likely for your expensive camera and lens to flop over and get damaged. The Arca quick release is the standard used by many manufacturers and has the largest number of compatible camera and lens plates and clamps available. Second only to Arca, I have a Kirk ball head and several of their L-brackets and quick-release plates for my cameras and large lenses. Check out some of the reviews on ball heads found on dpreview.com. There are some strong new contenders out there that you might overlook. Surprisingly, there are even a few good Chinese made ball heads. Once again, don’t skimp on your tripod and head. You will have them for a long time and you’ll always wish you had better if you get something cheap. Gitzo and Arca-Swiss are premium brands with a premium price tag, but there are other brands that perform quite well. Bogen, Manfrotto and Giottos are less expensive alternatives, and some of the new Chinese made brands have some great travel tripods. But I say, splurge and get the best you can afford.